Great location and comfortable accommodations with beautiful views. Greg is always helpful. We have been dealing with him for years and he has always been responsive when we contacted him. We will be going back again in 2020. Greg made the whole process very easy! Had a great stay, will definitely use Basinview in the future! Easy to do business with. The process was flawless. Good location. Condo was clean and adequate for our stay. Ive stayed at Wolf Lodge thru Basinview Lodging each time I visited Powder Mountain. 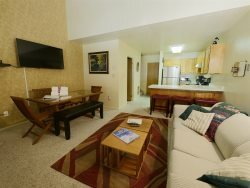 Ive always found great accommodations at a great value and have had no reason to look elsewhere. This was actually the best part of the whole stay. I don't normally call staff regarding a stay but in this case I had to twice and Greg could not have been more friendly, understanding, professional, and efficient! Every time I have stayed at Wolf Lodge I have enjoyed the coziness and affordability and how close it is to Powder Mountain and Snowbasin. Beautiful condo! Nicest place we have stayed in 5 years of visiting Eden, UT! We were in contact with Greg , he is very fast to replying to any question. Thank you again Greg. We enjoyed our visit. You were there for three days and it snowed all three days which was super excited for us. The property was well stocked with everything we needed. We enjoyed the balcony a lot. It was magical. Overall I recommend this place it's amazing. Greg was responsive to our booking request and provided clear instructions on how to gain access to it. Other than that, we really didn't have the need to communicate with him or any of the rest of the staff. Overall excellent! The only shortcomings were the off-season pool and hot tub closure and the sofa (which was sunken in due to age). We visited in the summer and had a great time playing at the beach at Pineview reservoir and riding bikes with our kids on the paved trail. We also played at the pool and some rounds of mini golf at the condo. There is also a few cute little cafes that we enjoyed. There was a blues and brews festival close-by at Snowbasin. The condo is very clean and nicely decorated. It had everything we needed for our family including a lot of space and comfortable beds. Though officially a 2 bedroom condo, there is a third room downstairs with bunk beds perfect for kids. The kitchen is a bit dated, but very well kept and completely stocked (even had a popcorn popper). The dining table was plenty big enough for us all to enjoy a meal together (we had 6 of us). There is a grocery store close by to pick up food to prepare and a few small cafes if you don't want to cook. We were there in the summer and had fun playing at Pineview Reservoir and the pool at the condo. There is a mini golf course that we did a couple times with our kids. We aren't golfers, but the condo property is on a golf course. We hope to come back in the winter and enjoy the winter activities since the bus to Powder Mountain is literally steps from the condo. We live in Eden and do not have guest rooms for family when they visit. They love staying with you.